TAXImet is a GPS based Taxi meter app. This is affordable easy to use app for taxi drivers. 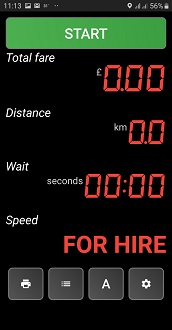 TAXImet meter can be used in any type of taxi for metering and billing. 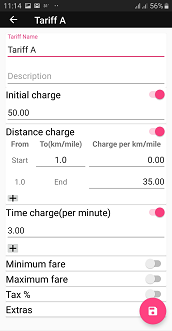 App user can customize the charging plan according to the Taxi category. TAXImet app is developed and published by Innovemind Pvt Ltd.
Downlaod TAXImet App from the play store. Place your phone on the vehicle dash board or mount to the wind screen. 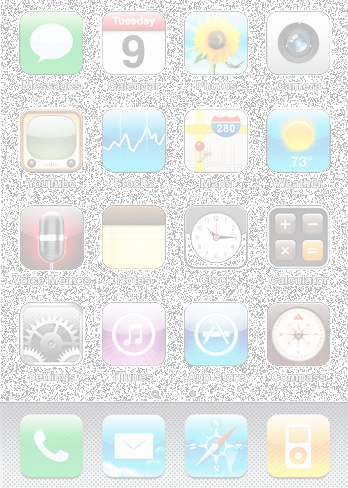 Phone should receive GPS signal to operate. 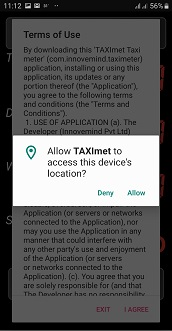 Open the App, it will ask permission to enable GPS (Location). 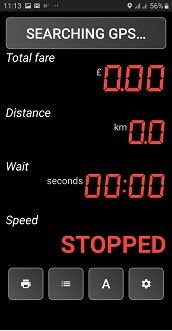 Press Ok. START button will be activated when you are receiving GPS signal. Press START to start the journey. Press END to finish when you reached the destination. 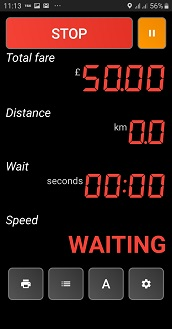 You can see the Fare, Distance and Waiting time on the screen. Access the TAXImet settings using, settings button at main screen. 1. 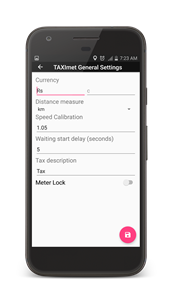 General Settings: To change the main settings such as Currency, km or miles, waiting start delay, Tax type and to calibrate the speed to match with odometer. 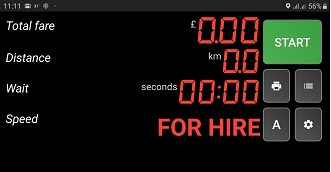 Our services extend from a simple taxi meter app. If you want to grow your taxi business we can help you. 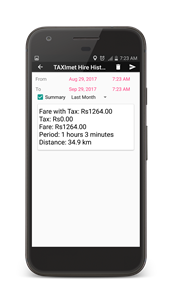 We provide advance sofware features such as, Tracking and Monitoring your taxi fleet, Taxi rider app, Taxi billing system, and any other customized Mobile Apps with backend support. Please contact us and send your requirement to discuss a feascible solution. 1.1 We are committed to safeguarding the privacy of our customers, website visitors and software users. 1.2 This policy applies where we are acting as a data controller with respect to the personal data of our customers, website visitors and software users; in other words, where we determine the purposes and means of the processing of that personal data. 1.3 We may deploy Google AdSense/Admob advertising in some/all of our software where it may use an anonymous identifier, a random string or a character that is used for the same purpose as cookie on platforms including certain mobile devices, where cookie technology is not available. AdSense/Admob is advertising service provided by Google Inc. through which third parties may be using cookies, web beacons, and other technologies to collect information and usage as a result of ad serving. If you are in European Union, we will ask you to consent to our use of Ad technology providers when you first use our software. 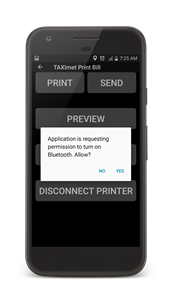 1.4 Our software incorporates privacy controls which affect how we will process your personal data. By using the privacy controls, you can specify whether you would like to receive relevant advertising and limit the publication of your information. 1.5 In this policy, "we", "us" and "our" refer to Innovemind Pvt Ltd. For more information about us, see Section 13. 3.2 We may process data about your use of our website, software and services ("usage data"). The usage data may include your IP address, geographical location, device type, operating system and version, referral source, length of visit, page views and navigation paths, as well as information about the timing, frequency and pattern of your service use. The sources of the usage data are Firebase Analytics, Google Play and Admob. This usage data may be processed for the purposes of analysing the use of the website, software and services. The legal basis for this processing is consent OR our legitimate interests, namely monitoring and improving our website, software and services. 3.3 We may process your account data ("account data"). The account data may include your name and email address. The source of the account data is you or your employer. The account data may be processed for the purposes of operating our website, software, providing our services, ensuring the security of our website, software and services, maintaining back-ups of our databases and communicating with you. The legal basis for this processing is consent OR our legitimate interests, namely the proper administration of our website, software and business OR the performance of a contract between you and us and/or taking steps, at your request, to enter into such a contract. 3.4 We may process your information included in your personal profile on our website, software ("profile data"). The profile data may include your name, address, telephone number, email address, profile pictures, vehicle details, location and employment details. The profile data may be processed for the purposes of enabling and monitoring your use of our website, software and services. The legal basis for this processing is consent OR our legitimate interests, namely the proper administration of our website, software and business OR the performance of a contract between you and us and/or taking steps, at you request, to enter into such a contract. 3.5 We may process your personal data that are provided in the course of the use of our services ("service data"). The service data may include details of services you have requested or we have provided. The source of the service data is you or your employer. The service data may be processed for the purposes of operating our website, software, providing our services, ensuring the security of our website and services, maintaining back-ups of our databases and communicating with you. The legal basis for this processing is consent OR our legitimate interests, namely the proper administration of our website, software and business OR the performance of a contract between you and us and/or taking steps, at your request, to enter into such a contract. 3.6 We may process information that you post for publication on our website, software or through our services ("publication data"). The publication data may be processed for the purposes of enabling such publication and administering our website, software and services. The legal basis for this processing is consent OR our legitimate interests, namely the proper administration of our website, software and business OR the performance of a contract between you and us and/or taking steps, at your request, to enter into such a contract. 3.9 We may process information relating to transactions, including purchases of goods and services, that you enter into with us and/or through our website or software ("transaction data"). The transaction data may include your contact details, your card details and the transaction details. The transaction data may be processed for the purpose of supplying the purchased goods and services and keeping proper records of those transactions. The legal basis for this processing is the performance of a contract between you and us and/or taking steps, at your request, to enter into such a contract and our legitimate interests, namely the proper administration of our software, website and business. 3.10 We may process information that you provide to us for the purpose of subscribing to our notifications and/or newsletters ("notification data"). The notification data may be processed for the purposes of sending you the relevant notifications and/or newsletters. The legal basis for this processing is consent OR the performance of a contract between you and us and/or taking steps, at your request, to enter into such a contract OR. 3.11 We may process information contained in or relating to any communication that you send to us ("correspondence data"). The correspondence data may include the communication content and metadata associated with the communication. 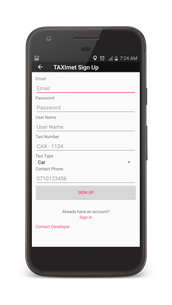 Our software, website will generate the metadata associated with communications made using the website contact forms. The correspondence data may be processed for the purposes of communicating with you and record-keeping. The legal basis for this processing is our legitimate interests, namely the proper administration of our software, website and business and communications with users. 4.1 We may disclose your personal data to any member of our group of companies (this means our subsidiaries, our ultimate holding company and all its subsidiaries) insofar as reasonably necessary for the purposes, and on the legal bases, set out in this policy. Information about our group of companies can be found at www.innovemind.com. 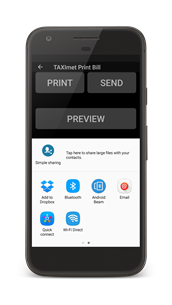 4.3 We may disclose your personal data to our suppliers or subcontractors identified at https://apps.admob.com, https://firebase.google.com, https://www.payhere.lk insofar as reasonably necessary for the proper administration of our software, website and business. 4.4 Financial transactions relating to our website, software and services are handled by our payment services providers, Google, Payhere. We will share transaction data with our payment services providers only to the extent necessary for the purposes of processing your payments, refunding such payments and dealing with complaints and queries relating to such payments and refunds. 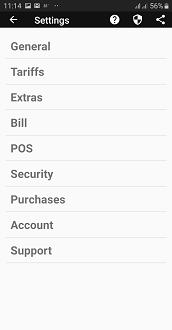 You can find information about the payment services providers' privacy policies and practices at https://pay.google.com/about/, https://www.payhere.lk. 5.2 We have offices and facilities in Sri Lanka. 5.3 The hosting facilities for our website, software are situated in United States. 5.4 You acknowledge that personal data that you submit for publication through our software, website or services may be available, via the internet, around the world. We cannot prevent the use (or misuse) of such personal data by others. 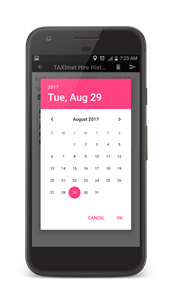 (a) Personal data category or categories will be retained for a minimum period of three months following date of collection, and for a maximum period of two years following date of stop usage. 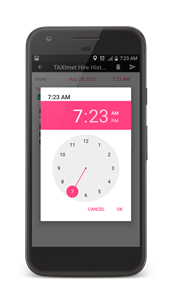 7.3 We may notify you of significant changes to this policy by email or through the private messaging system on our software, website. 8.3 You have the right to confirmation as to whether or not we process your personal data and, where we do, access to the personal data, together with certain additional information. That additional information includes details of the purposes of the processing, the categories of personal data concerned and the recipients of the personal data. Providing the rights and freedoms of others are not affected, we will supply to you a copy of your personal data. The first copy will be provided free of charge, but additional copies may be subject to a reasonable fee. You can access your personal data when logged into our software, website. 8.13 You may exercise any of your rights in relation to your personal data by written notice to us OR by e-mail, in addition to the other methods specified in this Section 8. 13.1 This app or website is owned and operated by Innovemind Pvt Ltd.
13.2 We are registered in Sri Lanka under registration number PV103418, and our registered office is at 29/1, Rathnapura Road, Ingiriya. 13.3 Our principal place of business is at 29/1, Rathnapura Road, Ingiriya. Sri Lanka. 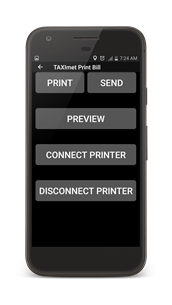 (d) by email, using the email address published on our app, website from time to time. 14.1 Our data protection officer’s contact details are: innovemind@gmail.com.